Forged in Fire Season 5 Episode 3 Winner!! We hope you were able to watch the recently-aired episode 3 of Forged in Fire season 5, as Tony of TF Blades was named Forged in Fire Champion. His work ethic, incredible attention to detail, and amazingly sharp blades caught the judges eyes and led to a $10,000 win! 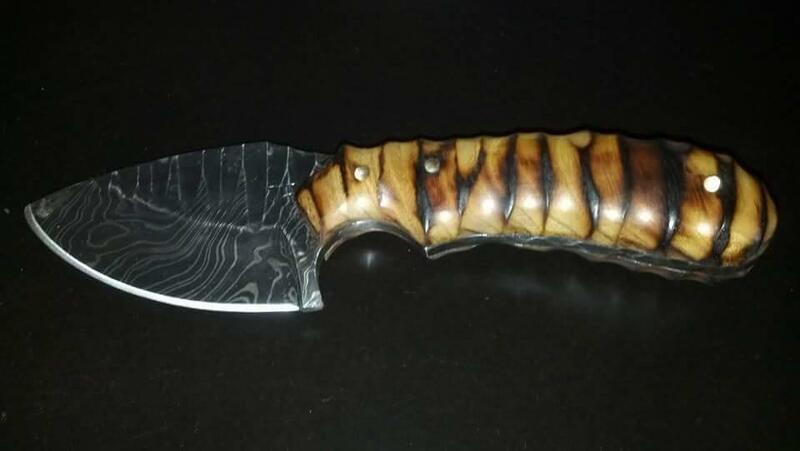 Utilizing the same techniques that have been practiced by skilled craftsmen for centuries, we take pride in making all of our knives by hand, one at a time. Our hand-picked and custom made billets ensure you’ll get a blade that you can rely on and have confidence in for years to come – always tough, sharp and dependable. 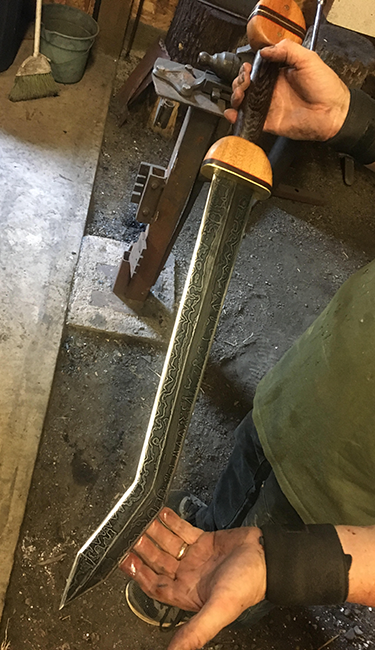 By taking skills learned from traditional blacksmithing, and knowledge learned from hours in front of the forge, TF Blades strives to remain on the forefront of metallurgical processes but maintain a large part of the craftsmanship required to provide you with a quality creation. Visually interesting cuts of wood are hand-selected not only to enhance the pattern and design of the blade, but also to complement the heft, balance and feel of the blade in your hand – no two are the same. 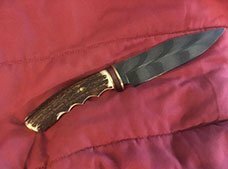 Tony Fetters, the sole Bladesmith behind the hand-crafted TF Blades, has over 30 years of experience working in a forge. After his time serving our country as a Marine, he started blacksmithing as a farrier over an 11-year career. He continues serving his community as a police officer with a SWAT sniper background as well. His love of creating works of art out of steel grew from hobby to passion to obsession. 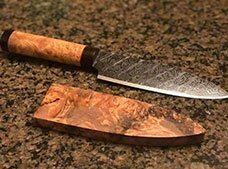 Completely self-taught, his appetite continues to grow from forging simple knives to fully custom and functional, pattern-welded singular steel blades. 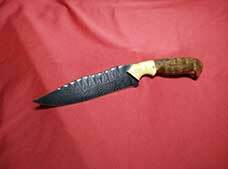 These range from small and large hunting knives to world-class kitchen cutlery. His extensive understanding of military and law enforcement pours into his tactical blades as well. Tony uses the highest quality, high carbon based steel, 15 n20, 1084, 1095, cable, and chainsaw chain. 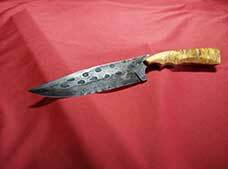 Each of his knives are fitted with hand crafted handles from exquisite and unique wood, antlers, micarta, and bone. All his edges are whet stoned to paper shredding sharpness. 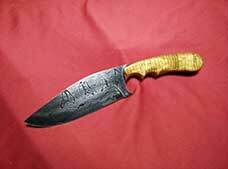 Our sheaths are made by hand to fit each blade perfectly. Motto: My Blades are Born in Fire! 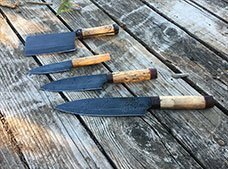 Utilizing techniques that have been used for centuries, as well as applying traditional blacksmithing knowledge, we work with you to create your one-of-a-kind custom knife. From different blade materials, to the blade pattern, to the material selected for the handle, we are hand’s-on from beginning to end. Hand-cut leather. Sinew stitching. Precise measurements. 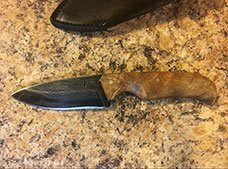 All of these combine to make a sheath that you can be proud of, and rest assured that it will protect your TF Blades knife just as it was intended to. 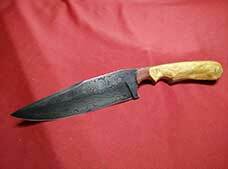 Each and every sheath is made to be a custom-fit for your particular knife. Just a few examples of our work, please take a closer look.